Hello! Did everyone have a fantastic weekend? I sure hope so!! We had a really nice weekend. On Saturday we went out of town to do some shopping & have some fun. We went shopping for Halloween costumes for the boys & they both picked out something they really really like! Then we went to the mall and made our way through several stores. After the mall everyone was getting hungry so we went to Olive Garden & enjoyed a wonderful meal. I can't remember what mine was called but it was soooo yummy!! It was a dish of angel hair pasta with mozzarella, fresh tomatoes & basil in a light cream sauce topped with grilled shrimp. Is your mouth watering? LOL!! Like I said Yummy!! After the Olive Garden we made a stop at Michael's. The boys weren't too thrilled--what can I say they are all boy! But they were both really good and I was able to pick up a few things while we were there. On Sunday we went to church & then out to eat with my Mom & Dad. Our afternoon was kind of laid back, nice & relaxing. Sunday night we went bowling. I haven't been bowling since before I started having all the problems with my arm so I had to bowl with my right arm. It took a little while to get the hang of that--I'm sure it was a sight! LOL! At first I felt like no matter what I did I didn't have any control over the ball. But as the night went on it seemed to get a little better. The boys seem to really enjoy bowling especially Evan, he gets so excited!! My Mom & Dad even came out to the bowling ally for awhile & my Dad came out and bowled with us for one of the games. I can't believe we are nearing the end of October & soon it will be Halloween!! I just hope that the weather will still be nice at the end of the month!! You just never know in MN!! 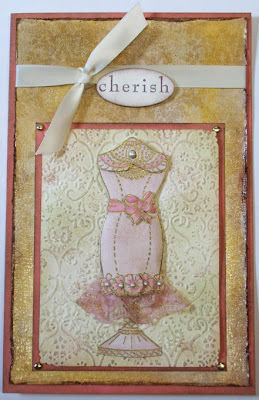 I wanted to share with you the cards that we made this month in class. 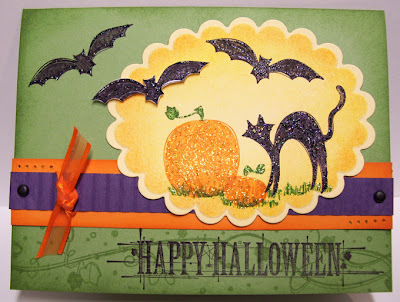 This first card is a fun Halloween card with a twist on the fold. 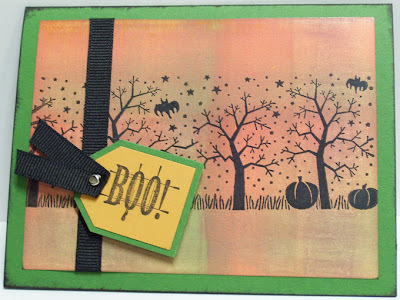 The stamp set that was used for this card is SU Autumn Apparitions, which can be found in the SU Holiday Mini Catalog. The second card is a Reflection card. The Tutorial for this technique can be found Here. I think this was the favorite card for the night!! I know it is one of my favorites!! The stamp sets that were used for this card are SU Wanted & So Many Sayings. This is the first time for inking up the Wanted stamp set & I love it!! I already have several ideas sketched out in my book!! 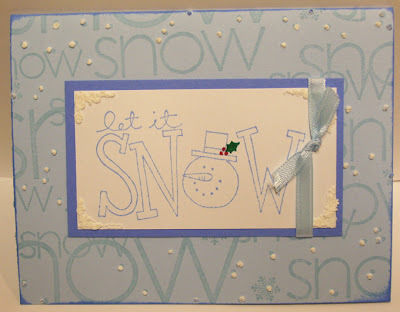 For the last card a CTMH stamp set was used, Victorian Snowflake. 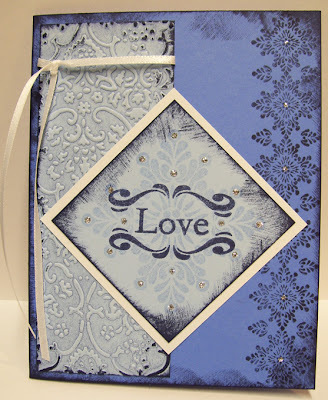 I really love this stamp set, it has such a lacey look. Thanks so much for stopping by & I hope you have a wonderful week ahead of you!! Wow!! What a fun award!! 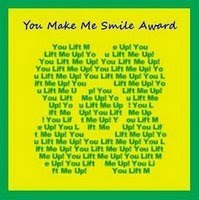 I have to say a special THANK YOU to my newest bloggin' buddy Corie, she nominated me for the You Make Me Smile Award!! Corie makes me smile too!! You have to check out her blog--she does some amazing design work!! So now it's time for me to nominate 5 ladies that make me SMILE! The first lady I am going to nominate is Ema, she makes me laugh & smile all the time! Ema & I met a little over a year ago when we were on a Design Team together & we have been great friends ever since. She just recently started her blog. You have to check it out! 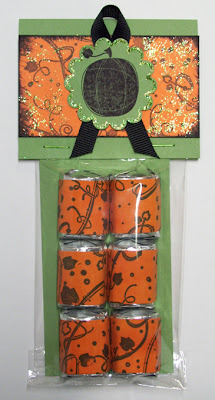 She has some really funny post & wonderful design work--check out the post about the can opener!! LOL!! *wink* Next is another very sweet friend Renee we met on a MB some time ago and have become really great friends. You'll have to check out her blog, she makes wonderful PBA's!! Do you like Photography? 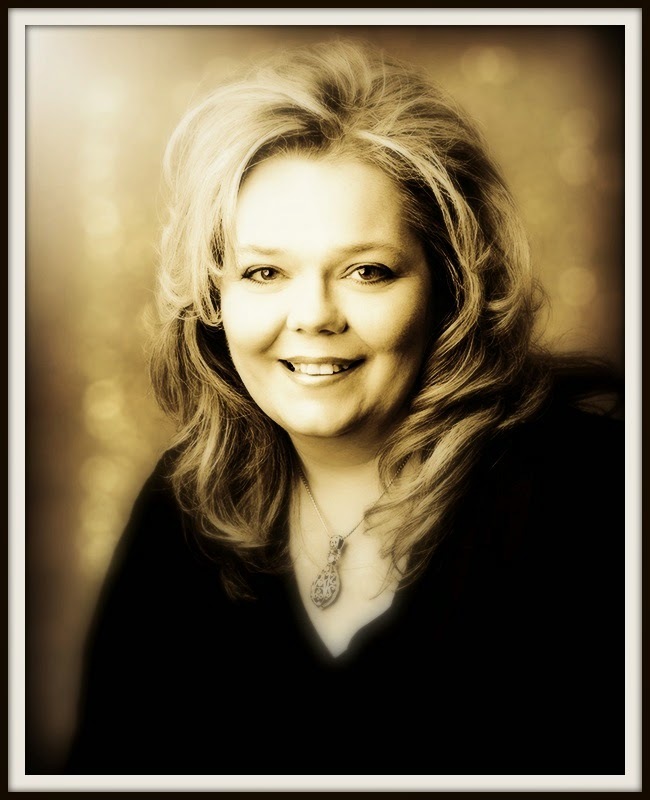 If so you will have to check out Deb's Blog! Deb also just recently started her blog and has been busy posting her beautiful photography. Jessica is another wonderful artist! I say artist because Jessica is so creative & loves all forms of art. She is stamper, bead maker & loves photography just to name a few! Sue makes me smile! I love looking at her blog! She is always busy creating wonderful designs! I hope all of you ladies will play along! Now it's your turn to nominate 5 ladies that make you smile! Thanks so much for stopping by & checking out my blog! I hope all of know how much I appreciate your wonderful comments & I also love checking out all of your blogs!! I hope you have a wonderful weekend!! Designs for Halloween. I love this time of year! I love the colors, the crisp scent of fall in the air, wearing sweatshirts & cooking all of the great comfort foods. Today I have a card & a little treat bag to share with you. Both of these designs were for a recent Halloween Class. I was so excited about making the card! 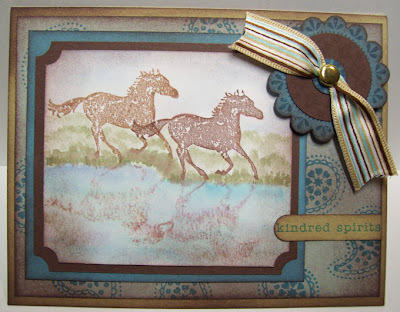 This is my first card using the new Nestabilities from Spellbinders! These are sooooo wonderful!! As my friend Ema would say--they are Wicked Awesome!!! LOL!! On the large scalloped oval I sponged SU-Summer Sun & then SU-Pumpkin Pie. Just a quick post to share a wedding card with you. I made this card today & really like the outcome! 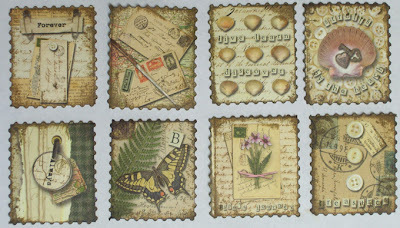 Yesterday I received my package from Prickley Pear so I thought I would try out some of my new stamps--gotta love fresh rubbah!! I made the background paper with one of the larger stamps. I think it almost looks like printed paper. For the cake I cut out three rectangles using Fiskars Shape Cutters. 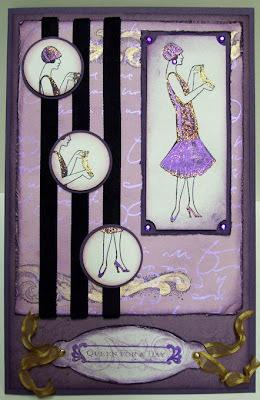 Then I used the Textile Embossing Folder from the Cuttlebug & ran it through the Wizard. I thought this would give it the appearance of frosting. I also rubbed a Versamark ink pad over each piece & then added some pearlex. I still wanted to give it a little bling so I punched out several tiny flowers, adhered them & added a pearl bead to every other flower. I hope you all had a Wonderful Wednesday & just think the week is already half way over!! Thanks for stopping by! As I'm sure most of you know this past Saturday was World Card Making Day and in celebration of this day I had a make-n-take here at my home. Isn't it wonderful we get to have our own special day!! On Saturday I actually had three different styles of this card, but this one is my favorite. 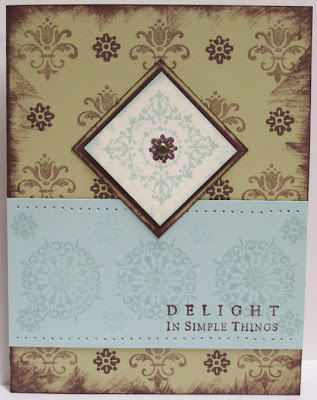 Almost all of the materials use to make this card are from the SU Simply Sent Kit~Simple Delights. I also used the paper piercing tool for the holes. For each example I used the exact same supplies from the kit and demonstrated how easy it is to achieve different looks from very simple to advanced. Thanks for stopping by & I hope you all have a great day!! Hello!! I know it's been a few days since my last post! I hope you all had a great weekend! How many of you were able to take a little time for yourself & enjoy World Card Making Day? I hope each of you were able to do something fun over the weekend & enjoy some creative time!! We had a pretty busy weekend around here. 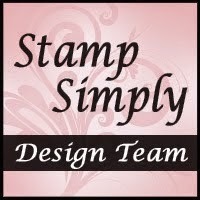 On Saturday I had a Stampin' Up! Open House with make-n-takes to celebrate WCMD. I really enjoyed the day & it's always fun to be able to visit with the ladies! I want to say Thank You So Much to all of the wonderful ladies that came on Saturday!! Later that evening I went to a Surprise Birthday Party! One of the ladies (Miriam) that comes to my stamping classes had her 60th Birthday on Saturday & her Daughter had a surprise party for her! It was a really nice party with family & friends & really yummy food! When I came home I had my own surprise!! I received an email from Liz at CHF (Cornish Heritage Farms) letting me know I had won a 'mini treasure' from the Worldwide Treasure Hunt!! I won the Summer Fun stamp set!! I can't wait to play with it!! I already have a few ideas sketched out-LOL-so I will be ready!! 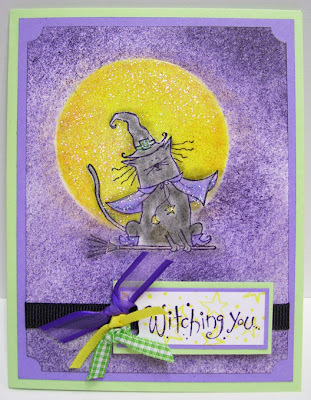 You should hop on over to CHF and check out the new line of stamps by Kim Hughes!! She has some really fun designs!! I have to say the Treasure Hunt was so much fun!! Along the way you had to look for CLUE WORDS & throughout the journey the Treasure Hunt took me to some wonderful sites with some amazing design work!! I thought it was a great way to celebrate a new stamp line. Here are a couple of cards that I made this last week. They were for customer orders but they were also for my friend Miriam (Surprise BD Party). I love how both of them turned out!! I didn't realize it until I was going to do this post but I forgot to take pictures of the card I made for her from myself! LOL! Thanks for stopping by & I hope you have a Marvelous Monday!! Sorry but this is going to be a little vent! Last night I received an email from one of my customers and she had some questions & said she hadn't heard from me in a while. I thought this was a little strange since I had sent her a few emails in the past several days & some of the questions she had I had already answered in previous emails. So instead of starting a new message I just replied to hers & it went through, she received it in just a few minutes. I started thinking about it & realized I had only heard from just a few people, so I was wondering if other people hadn't received the emails I was sending out. It was getting kind of late but I quickly sent out a few emails to ask some of the ladies if they had received any emails from me in the past few days. This morning I checked my email & I heard back from a few of the ladies. Some said yes they had received it but just hadn't replied back yet & the others said NO, but when they went & looked in their junk mail and there it was!! For some reason the past few times I have sent out mass emails about SU classes & workshops some of the computers are filtering them out as JUNK mail!!! Anyways--thanks for listening to me vent! I guess I have to look on the upside & hope for the best! It's Wednesday & the sun is shinning!! We have been having RAIN RAIN RAIN so it is nice to see the sun!! I hope you all have a WONDERFUL WEDNESDAY!!! These are a couple of ATC's that I made for a swap. 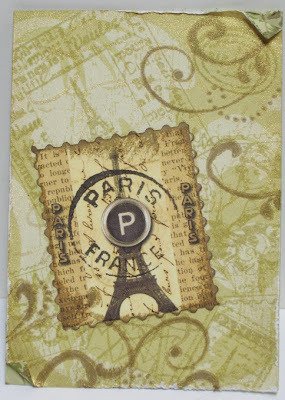 I am in a monthly ATC swap at our LSS and in August our theme was travel. The theme for September was Red but I haven't taken any pictures of them yet. So I'm running a little behind with posting this-lol! For the center image I used some printed paper (sorry I'm not sure about the company!) that I had bought at Archiver's some time ago & I have been hoarding it for just the right project. Do you hoard your supplies? Isn't that awful!! I am trying to use things more, I mean it's certainly not doing anything for me tucked in a corner sitting on a shelf in my craft room! *wink* The images were on a 12 x 12 sheet & I don't know if you can tell from the pictures but each one is embossed. This is a picture of all the images I used for the ATC's. 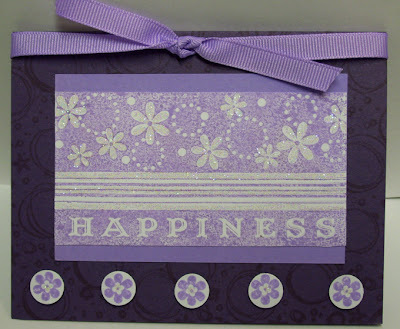 I used the Fiskars Stamp Paper Edgers to make a faux stamp & sponged Distress Ink by Ranger-Frayed Burlap on the edges. 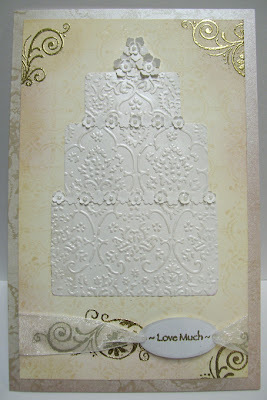 For the background paper I used SU Designer Series Brocade Background. 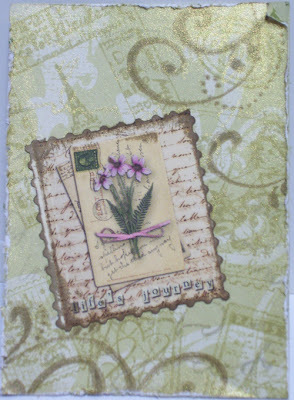 I stamped several different images on the printed paper, added some pearlex & distressed the edges. Thanks for stopping by!! I hope you are all having a GREAT week!! 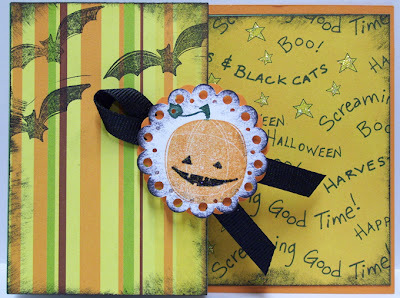 On Thursday I will be having a haunting good time & making some spooktacular goodies! 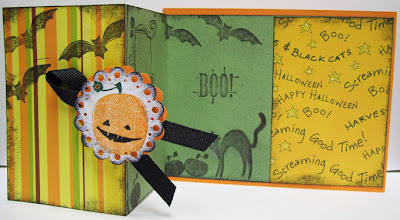 I am having a Halloween class & these are a couple of things we will be making. For this card we will be doing masking for the technique. I will also be demonstrating how to get the most out of your chipboard and using it for a stencil-this is how the moon was made. I love these little votive cups!! They are so cute & a nice decorative touch for Halloween! 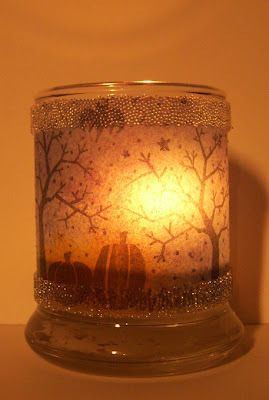 We will be making a set of votive candle holders, two cards & goodies bag. 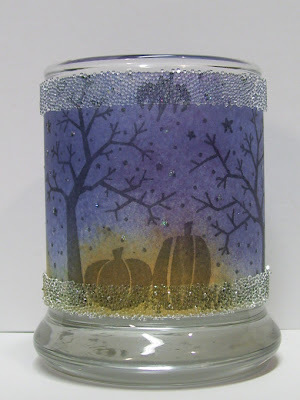 Stamp set~SU Haunting Halloween, Spooky Skyline (wheel).